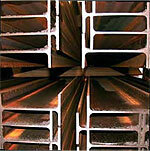 The history of supply of Steel Material goes back to over 25 years where we started our cooperation as permanent office of SAFET GROUP supplying material for Bafgh Bandar Abass projects since then steel business became our core business for all these years, particularly supply of special alloy steel from well- known European steel mills. Our expertise is to search and collect different types of material from different sources including warehouses and mills to complete the requirement of contractors and projects. We also assist our customers for procurement of commercial steel with perfect prices from the most reliable mill from far- east countries when the project could justify none European origin material and price is the main concern of project owners.